Hello fellow sailors! I have a 'new to me' 1972 Venture 17. After a good look at the keel, I need to repair some significant cracks in the fiberglass. It looks like the keel roller on the trailer was a bit low allowing the axle to hit the keel starting the damage. From what I've read, it appears the keel has several pieces of steel welded to a center steel section. Question: is there wood laminated in front (leading edge when the keel is swung down) of the steel? I have read Fix it and Sail along with several on line tutorials as well as West Systems fiberglass boat repair and epoxy data sheets. My thoughts are to keep the keel on edge like it sits under the boat (flipped over actually) to help keep any bow from setting in. Ideally, I'd like to scarf in below the section that enters the keel pocket as it fits well and looks to be in good condition there. Any advice, thoughts, or comments? Last edited by Vssman; 01-11-2019 at 05:09 PM. Anyone? Hello, is this thing on? Stop in and say hello?? Its possible that not many people here have worked on a Venture 17 keel. I know I certainly havent. If you are on Facebook you could try Trailer Sailors and Pocket Yachts FB Group. Its a very active group I am sure you would find Venture 17 owners there. Or I think Macgregor has its own forum too. HI! Thanks for the reply. I understand on the possibility of not finding anyone that might have undertaken this type of project. I did join New England Trailer Sailors but ran into a dead end there. I'm not on Facebook but may go through the wife's account to have a look see. It looks like most of the Macgregor talk is about the 26. I had a Siren 17, didn't even realize there was a Venture model the same size which preceded it! So you're saying the keel structure is lead attached to a steel structure, then the whole thing glassed? I'd want to know that what's underneath those cracks isn't rusting out and falling to pieces before I just glassed the whole thing up again and called it good. The Venture has a 1.42 ' shoal draft keel section on the hull with a laminated 4.5' centerboard/swing keel coming out of it that hangs about the same as on the Venture 24 even though the 24 appears to eliminate the shoal keel component that is part of the hull. In this video by Mr Angus he shows his repair to his Venture 24 centerboard/swing keel. It looks to my eye like there is a 3" to 4" iron or steel bar near to the edges of the centerboard and just fiber reinforced Bondo used to fill and fair it out without any wood so chances are that the 17 is similar. I would be tempted to treat the metal with Ospho to convert any rust left in the iron/steel into iron phosphate neutralizing it before adding any bondo or fiberglass. Once you start grinding it should become obvious what needs to be done, just don't stop short and be sure to get past the area where its rusted inside. I had seen that video searching YouTube and noticed the trailing edge was formed out of filler. There's a few other sites with photos that show wood on the leading and trailing edges wrapped in fiberglass. We'll find out what's in there once I get cracking on the rebuild. I'm currently refinishing the rudder. When I start on the keel, I'll be sure to take photos and post how it's put together for anyone that runs into the same problem down the road. I currently have West 105/205 but probably should get some 206 so that I have a bit of additional work time. If I do need some body filler, I assume vinyl ester is the 'stuff' for underwater use? Of course, over coated in epoxy and gel coat. Fiber Reinforced Polyester such as Kitty Hair or Duraglass will do with a good barrier coat however if budget allows for it the 3M Reinforced Vinyl Esther might do nicely too especially if you are going to leave the boat on the water however I usually see it used to do repairs over the fiberglass mat and then faired over and not underneath the mat. West 403 or 404 with will also do nicely especially in high stress areas at the pivot bolt, lock pin and cable attachment point. Don't use a polyester automotive filler that has talc in it. There isn't enough information in that photo to really tell what is happening or even what part of the boat you are looking at. The other thing is that Macgregor tended to make changes during production so that there could be pretty big variations in how the centerboard is actually constructed. If we are actually looking at the centerboard (drop keel), rather than the bilge area of the centerboard trunk, then my first suggestion is to grind away any areas of loose or cracked glass until you get to either solid glass or the core of the centerboard. At that point take pictures so that we can evaluate the conditions that you have discovered. 3. If you have ground down through the laminate (f.g. reinforced portion of the skin on the board) then clean up and grind the sides and edges of the centerboard roughly fair, and glass over them with several layers of cloth and resin. I personally would favor epoxy for its better adhesion, ductility, hardness and minimal imperviousness. But epoxy is more expensive and harder to work with than something like Vinylester resin, so if epoxy is not an option then I would use vinylester resin. I would not use polyester. For reinforcing I would use a mix of biaxial and heavier conventional F.G. fabric. 4, Once you had perhaps 2 to 4 layers of cloth, I would fair with either thickened epoxy (I would recommend MAS epoxy or a non-amine blush version of West System if you use epoxy) or with thickened vinylester. My pet trick for fairing is to use a notched trowel (squeegee with notches) and to apply the thickened resin so that the grooves from the trowel leave distinct and comparative straight lines the long dimension of the item that I am fairing. The raised portions are easier to grind to a fair shape. (Use a batten or make a template to check fairness). Once fair it is easy to fill the grooves flush with the tops of the now faired raised portions of the filler. Once sanded fair again I would put on a coat or two of epoxy or vinylester resin (depending on which you used for the project) to seal any open pores in the filler. And finally sand the surface smooth and apply a barrier coat either of epoxy, vinylester or a product like Interprotect or Petit protect which also make great primers if you intend to put bottom paint on. The above are sort of the worst case procedures, but also the ones that you are most likely to encounter. MacGregor who built the Ventures closed their doors back in 2015, and the successor company, Tatooyachts appears to have closed as well so I don't think that you can buy a replacement board. They are about 80 lbs and the same swing keel was used on about 11 different models from 1968 through 1987 - Macgregor 21, Macgregor 22, Macgregor 25, Venture 17, Venture 21, Venture 22/224, Venture 23, Venture 24/224, Venture 25. $695 but still available in limited supply today. They also have all the pivot, lock bolt, cable tubes, etc for that boat along with a number of other parts specific to the Macgregors. 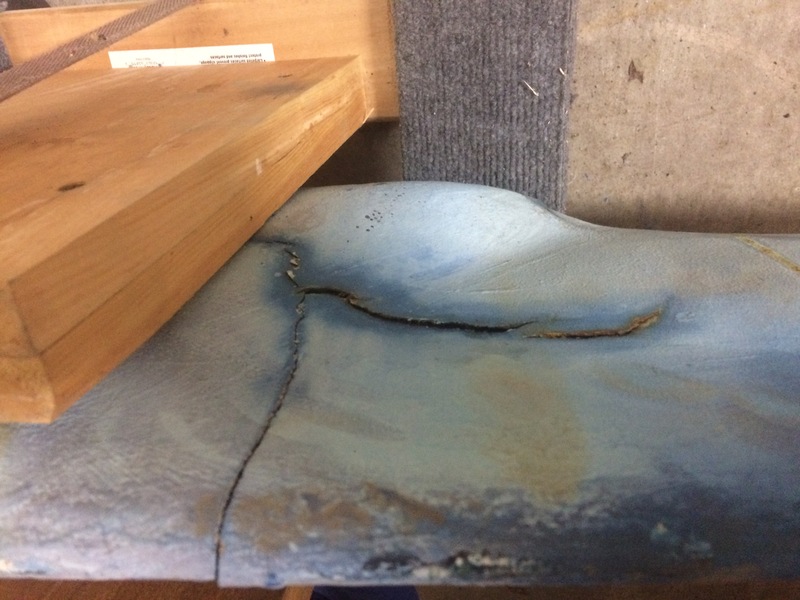 Looking more closely at picture of the Swing Keel sitting in the cradle it appears the damage goes all the way from front to back so you may even have to replace some of the steel inside and do some welding. It may be time to bite the bullet and buy a new one while its still available. The poly vinyl filler is almost $150 a gallon depending on where you can buy it and your going to need a lot of it to deal with that much damage so really price out what it will cost you to repair it yourself compared to buying a fresh new clean one. You may find that with filler, resin, fiberglass mat, steel, Ospho, fairing compound, etc you may end up halfway to the cost of replacing it. Get into it quickly before the last few replacements are sold and that option is no longer available. Last edited by SeaStar58; 01-16-2019 at 03:34 PM.